The mold training course is being expanded to include a full-day mold remediation training. The first day of the course will primary focus on how to recognize indoor mold, how to develop effective sampling strategies, and how to interpret laboratory results. The second day will dedicated to how to perform effective mold remediation/abatement. 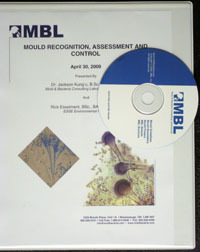 Dates for this unique mold training course will be posted soon. The course has not been expanded as yet but we’re still exploring the possibibilities of provinding a 2 days course. To register for our one-day course, click booking calendar.